Classic styling and a comfortable low riding position. The cruiser motorcycle that helped re-define and re-imagine the new generation of American cruisers has returned in 2012 - better than ever. The Victory Vegas custom cruiser motorcycle returns this year with the ability to handle any road on the map, without sacrificing even a tiny bit of power. Instead, we've made it more ferocious than ever with the addition of a 106 cubic-inch Freedom V-Twin engine that rockets you along with 97 horsepower for the ultimate custom cruiser motorcycle experience. Featuring the long, low and slick profile that Vegas riders have come to expect, the 2012 cruiser retains everything you love while upping the ante with more power and more value for your buck. Don't sacrifice performance for style, style for performance, or versatility for either one. With the Vegas cruiser, you get the ability to handle country roads, interstates, and city boulevards with the same level of roaring intensity. Don't take our word for the unprecedented performance or the undeniable cruiser motorcycle style. 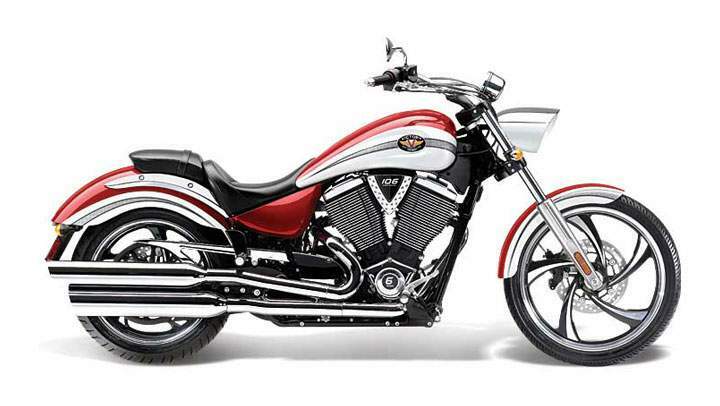 Find a local Victory motorcycle dealer around you and ask to test drive one of the new 2012 Victory Vegas custom cruisers. Follow your passion to ride with a spin on one of these bikes, and you'll understand why so many have been converted already. o The recommended oil change interval for 2011 models is every 5,000 miles (8,000 km). o Less-frequent oil changes results in a lower cost of ownership. o In terms of operating sound, selected modulation frequencies have been eliminated. This produces a more-appealing sound - consistently in each gear. In 4th and 6th gears in particular, gear whine has been reduced. o Driveline lash has been reduced by 66%. o "Neutral Assist" has been added to make it easier for a rider to shift into neutral when stopped. This will reduce the rider's effort, will reduce clutch wear and will lessen the performance demands on the oil. o A large LCD that displays: Clock (time of day is viewable at all times), gear position, tachometer and diagnostic readouts for Victory dealership service technicians. o The Cross Roads instrumentation also has an always-viewable fuel gauge. o All left- and right-hand switch cubes are black, as are the audio control switch block and cruise control switch block. Whether you're finding your way across town or cruising the city's glass canyons, the Freedom V-Twin power plant delivers 97 horsepower and 113 ft lbs of green-light torque with ultimate authority. The heart of every Victory Cruiser machine, it informs the world of your arrival with every crack of the throttle. The best performing transmission on the street collects the power generated by the massive V-twin and allows the Vegas cruiser to roll fluidly between the curbs. Helical-cut gears ensure that each shift will be as smooth and clean as the bike itself. Press the starter and you can feel deep in your chest an eruption of low-end torque. With each precision-tuned piston stroke, the Freedom V-Twin's 4-valve overhead cams and perfectly matched 6-speed overdrive transmission promise to provide unmatched throttle response, acceleration and passing power. Any road. Any time. The handlebars are designed for all kinds of riding since their ready reach means easier steering for riders of all sizes. The low 25.2" seat height works in tandem with the pulled-back handlebars to ensure a firm sense of mastery over the machine. Combine that with a more rearward placement of the foot controls and you have a rider who stays comfortable from points A to B and all the way to Z. One thing that sets the Victory Vegas apart from the rest of its cruiser family is its split-tail gas tank. The other is the way the tank's sculpted sides lead to a raised center spine, adding further testimony to the bike's aggressive spirit. Opting for precise, automotive-style cruise control means your right hand can just hang on and enjoy the ride. Choosing heated grips can add precious road time to both sides of summer, and may be the best means of enhancing your road warrior reputation.